“The Price I Paid for A Soul” from Christian Faith Publishing author Debra Watt is riveting and real. Watt’s human connection and love for her husband, Joel, transforms through the Lord into something much more worldly and bold. “The Price I Paid for A Soul”: a deep and genuine telling of the author’s personal trip to the Lord, and all the battles that came with it. 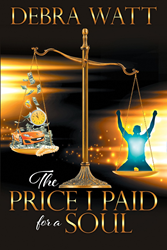 “The Price I Paid for A Soul” is the creation of published author, Debra Watt, prophetic intercessor, speaker, and life coach who has coached and ministered all over the world. Published by Christian Faith Publishing, Debra Watt’s new book is relatable in the realness of her path to the Lord. The Lord leads Watt through plenty of challenging times in both her professional and personal lives. Regardless of the trials she endures, Watt comes into the light more faithful and solid than ever. Through this literary exploration, others can find the faith to tackle the “real world” alongside the Lord. View a synopsis of “The Price I Paid for A Soul” on YouTube. Consumers can purchase “The Price I Paid for A Soul” at traditional brick & mortar bookstores, or online at Amazon.com, Apple iTunes store, Kobo or Barnes and Noble. For additional information or inquiries about “The Price I Paid for A Soul”, contact the Christian Faith Publishing media department at 866-554-0919.